Brief Synopsis: A retired police officer recounts his memories of his life in the DC Universe. Issue Notes: The events in this issue are told through flashback of the frame story protagonist, Paul Lincoln, now a very old man. The timeline of the events is quite different from how they were originally presented. (Batman was historically present for Superman's funeral.) It is unclear whether this rearranged chronology is an accurate history of the DC Universe following the Infinite Crisis, or whether the anachronisms are due to the failing memory of an old man. It is important to note that Lincoln himself has aged considerably since the events pictured herein, but the heroes have not. FASHION ALERT: Booster Gold is among the heroes walking in the funeral procession behind the horse-drawn casket of Superman. 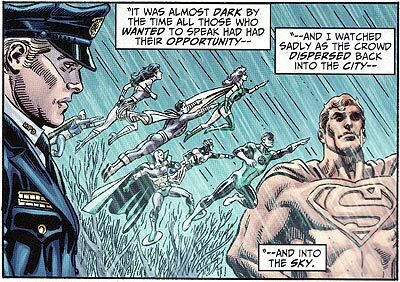 This procession was seen at greater length in Superman: The Man of Steel #20. Booster is inexplicably wearing his Mark I.v2 post-Infinite Crisis costume. His original Mark I power suit was destroyed by Doomsday in the same prolonged fight that resulted in Superman's death. In Superman: The Man of Steel #20, Booster wore blue jeans and a leather jacket to the funeral. Is this costume error an oversight by DC editorial, or is this really a time-travelling Booster Gold replacing his younger-self at one of the DC Universe's most significant events? Police Detective Paul Lucas salutes the casket as it passes. Heroes pictured include Black Canary, Bloodwynd, Captain Marvel, Flash II, Geo-Force, Green Arrow, Green Lantern II, Guardian, Ice, Maxima, and Wonder Woman. Not pictured but present are Aquaman, Big Barda, Dr. Fate, Flash I, Green Lantern I, Mister Miracle, and Nightwing. Booster Gold is seen among the heroes departing the funeral. Though Booster Gold's power suit was destroyed by Doomsday, his Legion Flight Ring continues to function to this day. 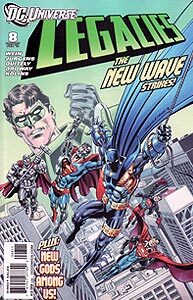 Boosterrific Review: This issue makes a suitable primer for those unfamiliar with the history of the DC Universe. More experienced readers may be disappointed in the issue's style, better used in precursor series from rival publishers (Marvels, Astro City). Most unsatisfactory about this issue in a series based on a man-on-the-street-eye-view of the DC Universe is the fact that the narrator, a Metropolis policeman, has inexplicably intimate knowledge about the activities of the Green Lantern Corps. This bit of narrative trickery required to include a major event in DC history rings exceptionally false given the borrowed stylistic construct of the series.